As can be seen from the illustration, the Hatherly Lattice bore a great resemblance to the step ladders in use today. It was made from ash and could be purchased in a variety of heights. It could apparently hold the weight of four men, one on each step. 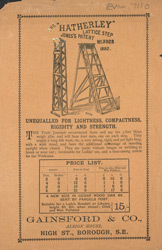 A ladder suitable "for a lady’s boudoir" or library could be purchased from this company for just 15 shillings.